Why did they add Tourmaline to the Mini BioMat? To increase the amount of Negative Ions that the person can receive in a session. Because of it's small size, the Mini-BioMat covers perhaps only half the body at best. 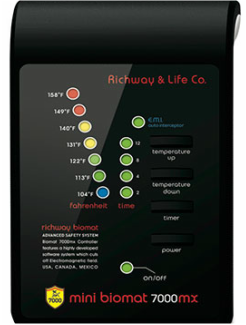 RichWay's R & D department discovered that those individuals using ONLY a Mini-BioMat were not receiving the expected amount of negative ions to reduce pain and free radicals, even though it had a Kurare super fabric just like the other sized BioMats to deliver the Negative Ions. So to increase this negative ion flow, it was decided to add alternating rows of Tourmaline so that the FIR could still be amplified through the amethyst and an additional dose of negative ions would be naturally discharged from the Tourmaline. This solution delivers the anticipated number of negative ions to the person. Keep in mind that a Mini-BioMat is no substitute for any full size BioMat. The Mini-BioMat is designed as a complimentary tool. The Mini BioMat was designed as an accessory piece to the BioMat Professional Set. The 'Mini' was not created as a replacement for full sized versions that affect the entire body. Many health benefits DO come with the use of a Mini however. Many people find this size ideal for the office chair and a perfect 'take-along' for trips. The Mini mat is designed to fold in an L shape to fit on a chair. Some elderly people and small children find it more inviting due to its small size. When air traveling, the Mini-BioMat fits easily into the overhead compartment of most major airlines [case size 22 x 6 x 19] or as checked baggage in some cases. Once you've arrived at your destination: the Mini-Biomat helps with jet lag: just 20 minutes on the low setting is like a power nap where you feel refreshed and ready to go! Car travel is great too! A separate 100 watt adapter can be purchased through an electronics store to use in the car. Great for use on long car trips as well; plug in at your hotel for an invigorating and refreshing 'pick me up' after a long days worth of car ride! The Amethyst/Tourmaline Mini-BioMat ships with a single control panel with timer, travel bag and 100% cotton quilted cover. Dimensions 33" x 17" Weighs 8.2 lbs and uses only 100 watts electricity! Pictured above is the New sleek Mini Mat control unit for all Mini Mats as of 2013. New padded cover with Dr. Hideo healing symbol reproduced on top. This cover goes on top of the Mini Mat for comfort, protection and enhances the negative ion therapy of the Mini Mat. The Mini-BioMat is primarily used in conjunction with the Professional sized BioMat or larger for a sandwiching effect. This cocooning increases the effects of both mats. Since each BioMat can deliver FIR 6-8 inches deep, this is a good option for larger bodied people so that it can get deep from both sides. This 'sandwiching method' is also used for many other issues like cancer care, flu & cold symptoms, and other immune system boosting concerns.